There are a lot of people these days willing to make money and foward industrializtion with little respect towards the enviroment and ecology. Please share stories of conservation happening in your area. Receive the weekly newsletter THE RELEASE for the latest news around TU. Renew your membership today and help protect the future of our nation’s cold, clean, fishable water. Together, we can preserve the thrill of chasing wild fish in wild rivers. Get your Life Member exclusive Winston PURE Rod and Cheeky Boost Reel. Become a Life Member to get yours! Yellowjacket Creek downstream of the diversion structure is now much more fish passage-friendly. The Russian River is one of the most famous steelhead fisheries in California. It is also one of the highest priority watersheds for Coho salmon recovery in the Golden State. has supported this effort through a combination of youth education, restoration, and monitoring projects (including a current study using PIT tag technology to monitor Coho utilization of floodplain habitat in the Laguna de Santa Rosa), while staff with TU’s California Water Project have worked to enhance dry season streamflows through the Russian River Coho Water Resources Partnership and to improve fish passage through restoration projects on Russian River tributaries, which provide vital nursery habitat for juvenile salmon and steelhead. 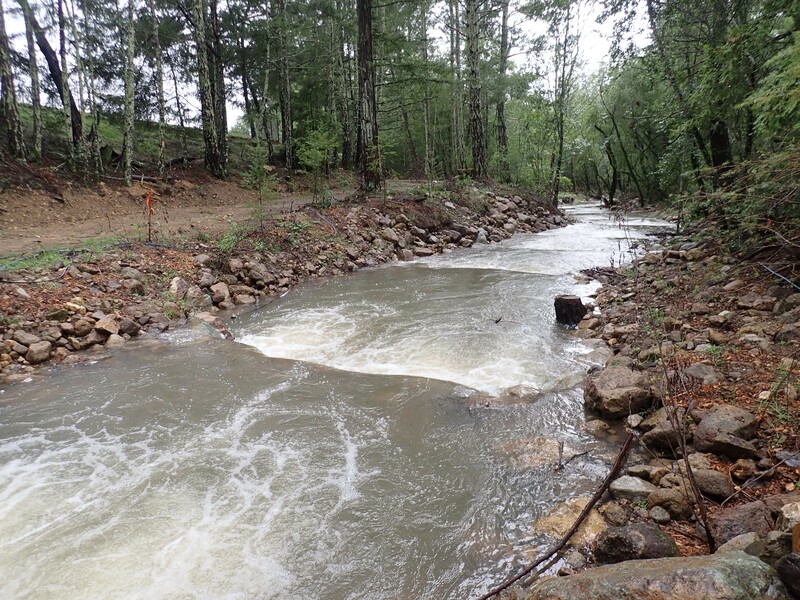 TU, working in partnership with Jackson Family Wines, just completed a high-priority project on Yellowjacket Creek, an important Russian River stream which flows on the Jackson family’s Kellogg Ranch in the heart of Knights Valley. (L) Yellowjacket Creek project post-construction and after the first rains of the season. The rock weirs restored passage to almost two miles of habitat above a concrete weir. 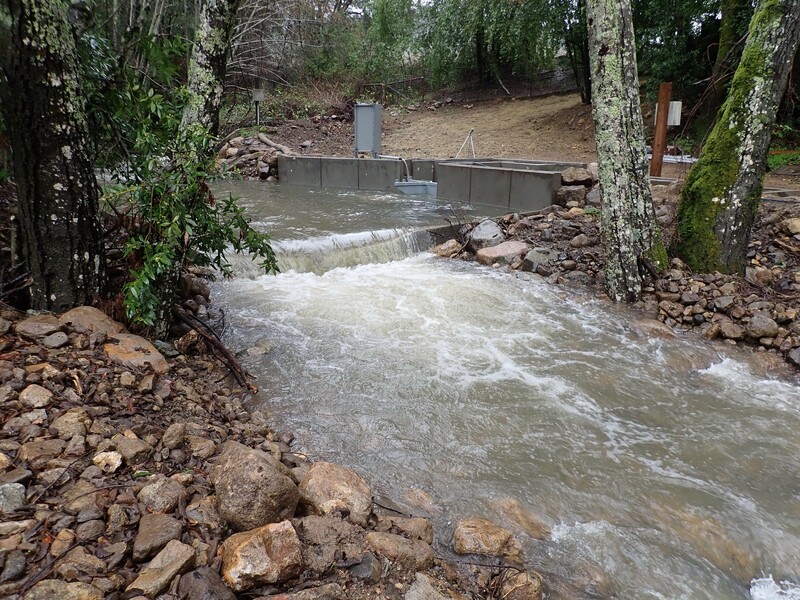 The Yellowjacket Creek project restored fish passage to almost two miles of high-quality spawning and rearing habitat above a concrete weir and spillway apron, which was a total barrier for migrating Coho salmon and steelhead. The upper reaches of Yellowjacket Creek are spring-fed, have cold water, and are perennial even during severe and successive drought years — perfect for juvenile fish. The project constructed a series of 33 boulder step pools and installed a new fish screen at the diversion structure. This project was funded by Jackson Family Wines and the California Department of Fish and Wildlife’s Fisheries Restoration Grants Program. Other members of the project team included the National Oceanic and Atmospheric Administration (NOAA Fisheries), FlowWest, and Parsons Walls. The Yellowjacket Creek project completed its construction phase in October 2018. Steelhead have recently been observed spawning in Yellowjacket Creek—in the project area. TU will continue to work closely with Jackson Family Wines, the California Department of Fish and Wildlife, and the National Oceanic and Atmospheric Administration to monitor the performance of the Yellowjacket Creek project. ~Mary Ann King and Sam Davidson. Mary Ann King is director of TU's California Water Project. Sam Davidson is TU's communications director for California and Oregon. All photos Mary Ann King except for the Russian River Coho image, which is courtesy of California SeaGrant. Share your support for Trout Unlimited! Find and support Trout Unlimited on your favorite social media site. Over 87 cents from every dollar contributed to TU goes directly into conservation programs. You're about to leave new.tu.org and return to the Trout Unlimited website. Do you want to continue?